The NPR Interview: Sandra Bullock On Filming In Zero 'Gravity' For her new film, the actress submitted to a singularly intense shooting regimen to achieve the movie's weightless visuals. She talked with NPR's Melissa Block about the filming process, which kept her alone inside a box for long stretches, listening to strange music and sounds. Many of the special effects in the action-adventure film Gravity were generated by computers — but star Sandra Bullock also had to put in a good deal of work, with choreographed movements simulating weightlessness. The eye-popping new movie Gravity will make you very grateful you're planted on terra firma. It's a thriller directed by Alfonso Cuaron, in which shuttle astronauts on a spacewalk are stranded after a collision with a vast cloud of space debris. And one of those astronauts — played by Sandra Bullock — is left on her own, hundreds of miles above Earth. She's running out of oxygen and tumbling untethered through the void of space. Bullock tells NPR's Melissa Block that she spent much of the shoot by herself inside a cube, basically doing a kind of modern dance to help create the illusion of a zero-gravity environment. "I likened it to Martha Graham," she says. "It was slow, modern, interpretive movements at 30-percent speed. And so my body would move as in weightlessness and contract the way your body would move in zero gravity." On filming inside "the cube"
It was basically a 9-by-9 LED box that was sort of on a platform. And it was at the end of a long track that held the arm that held the camera. And that arm was actually one of the robots that made the cars in Detroit. I know you've seen them in, you know, ads. They're going down the assembly line, these major arms. So that's how they were able to attach the camera and twist it and turn it in conjunction with my movement to simulate flipping upside down, things like that, when we were in the box. And that would come at you, and you made it your friend. And it was the only companion that I had for a while. But it was an ingenious way that they figured out how to shoot some of the sequences. The camera's actually synchronized, mathematically, to coincide with my pre-designed movements. So [together we] made it look like I was upside-down sometimes, in that box. And it was pretty amazing. It was very mathematical. And I did not do well in math. All I heard was either Alfonso's voice or these ... musical cues that we had picked out, and sounds that we'd chosen to sort of help me feel like I was in some kind of environment that felt like space. They sort of mold [earpieces] specifically to your ear, so the minute you insert them all sound goes away. And with the helmet and all the things I had to wear — so in a good way — it sort of eliminated any distraction. It was absolutely silent, until either Alfonso's voice was heard or I asked for a music cue to help me get to where I needed to go. Alfonso had the greatest collection — it was thousands of pieces of sound. And it wasn't just music. There were beautiful classical pieces in there. There were pieces from Radiohead. There were bizarre Inuit songs. There were noises, ambient sounds, rumblings, hollow metal screeching sounds, bizarre — whale sounds! ... So haunting and lonely. So it was all kinds of sounds like that. 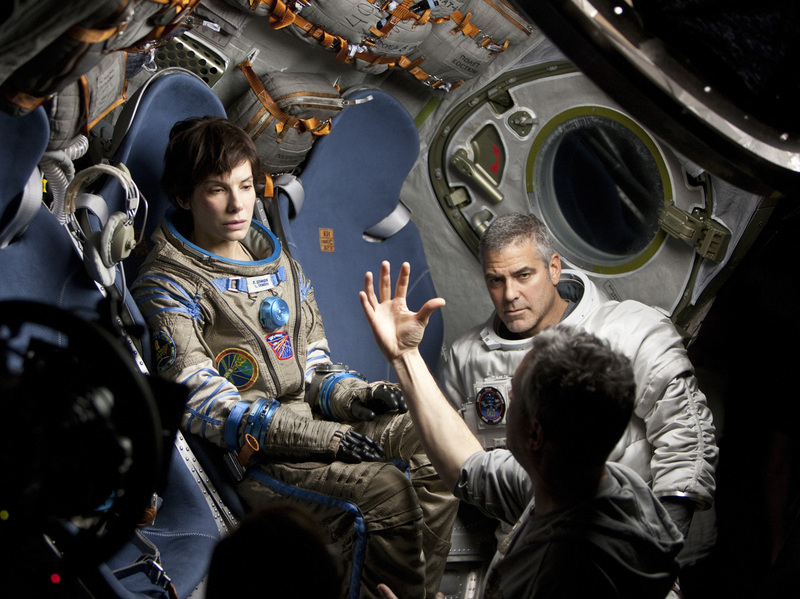 Bullock, on the Gravity set with co-star George Clooney and director Alfonso Cuaron, spent most of the shoot alone, in a box, to create the required sense of isolation and weightlessness. It didn't get me to where the character needed to go; it just eliminated all the frustration of what I had to remember mechanically, the long wait in between takes. And, you know, when you listen to music, and you hear sounds and orchestration, it's ... the fastest way, I think, to your emotions, even if you don't understand the language of the song. Music, somehow, breaks through, to everybody. And I'm very musically inclined. My parents were opera singers. As a young child, I could hear operas and I knew if they were sad, or if they reminded me of something, or they brought back a memory. And so I rely on music heavily, just in life and in my work. But this movie was very lyrical. And I realize that once I stopped fighting the technical process of how to move my body, I made it choreography. I said, you know, "Just let your body figure out the choreography, and let it be like a dance piece." So everything had to be very liquid, very fluid, and the music just helped you calm down, allowed you to be more relaxed, and not fighting the system all the time. Because the system was not conducive to any form of acting. It's just all wires and computers and lights, and things like that. Well, he was a little less than a year and a half when we started shooting this. And, you know, they created an entire wonderland outside of the sound stage, because the sound stage was completely black, and I was completely ensconced in this thing. So for him, he did not like seeing me in that position. So as much as possible, I kept him in the outside area. So that's, when the breaks happened, that's where I would go. Only when I was having a very tough day of it [was when] Alfonso would cue the child. And he would be brought in, and he would just be lifted up, and his little head would come through the only little square where I had, you know, a visual out into the sound stage. And I would just see his little face. And it ended up being worse, because he was so concerned. I saw the look on his face. He was trying to process — why are you locked in there, why are you not happy, why are you not outside with me right now? Then I would get upset, then I would get teary. And I was like, OK, that was a bad idea. But the beauty of it is, is that, at the end of the day, or when we had big breaks in between, I got to unplug [from] the head of this woman [her character, Ryan Stone] who had lost a child, and I got to go outside and I got to love on my child. And it just made me that much more appreciative of my time with him, and being outside, having my feet firmly on the ground. And, you know, we are making a movie, but it did make me see things in a very, very different light, because I missed him terribly. And it was just a couple hours at a time, but I'd never been apart from him for that long. It's taught me the word "no." And I was pretty good at learning it before and applying it. But, you know, my baby before was my work. That's what I had. And then I was given the blessing of this extraordinary creature and human being, who's turning into a good little man. And you just, you just realize that, you know, unless it's a great experience for myself and for him, or unless this experience that I'm being offered will benefit him down the road, I'm not leaving the house. Or I'm leaving the house, but I'm not going to go work. And once he's in school, you know, permanently in school, those moments for me to work will be very few and far between. And I'm so happy to embrace that. So yeah, I think it's changed me a thousand percent. And I think it's made me better. And I think it's made me, you know, less worried about if this film doesn't work, you know, "What do I have?" You know, I go, "I already have everything. And if this film doesn't work, it doesn't work. Nothing you can do." I've never had the opportunities that I'm being presented now. I've never had the opportunity to work as much as I have in the last five years. It's crazy. I had prepared myself for the second half of my life [to be] filled with other passions that don't include being in front of the camera. And then all of a sudden I got more work and more work and more work. And I went, "Well maybe things have shifted." And I think they have. But where I am, personally, means less work and less work and less work in front of the camera. I still love being creative. I still love the aspects of working together with great, talented people. But it's a weird dichotomy; I'm being blessed with more opportunities, but I'm going to be taking less of them. And I've done pretty much everything. There's not — I've pretty much kicked over every stone. And there's nothing in me that says, "I must create this particular thing." I don't have that right now. It might come up. But right now I'm just, I'm just having fun. And giving a sort of second shot at childhood and life — and I need to be present to do it.